Just as matching genitalia is not enough to get a lady feminist to support a female candidate, it turns out that so too is matching religion not enough to convince a Mormon feminist to vote for Mitt Romney. Not only is the small, but active community of American Mormon feminists not going to vote for him, they're McKayla Maroney-levels of unimpressed with the idea of a President Mitt Romney. Reuters asked several prominent Mormon feminists how they felt about Romney the candidate, and their response can best be summed up as *eyeroll*. Lisa Butterworth of Feminist Mormon Housewives said, "I pretty much know every Mormon feminist, and I can't think of any of them that are going to vote for Romney." A poll conducted by the feminist LDS magazine Exponent II found that almost 3/4 of Mormon feminists who responded were on Team Obama. Another prominent Mormon feminist said that Mormon feminists are like other, non-Mormon feminists, in that they tend to be supporters of candidates who support policies that would further equal opportunities for both genders. So, not stuff Romney likes. Romney's views on women's roles are still nakedly, obviously retro — from his comments during the debate about how it's important that employers give female employees flexible hours so that the women can go home and make dinner to the way his personal life is organized around a man going to work and a woman staying home and having babies and taking care of those babies. 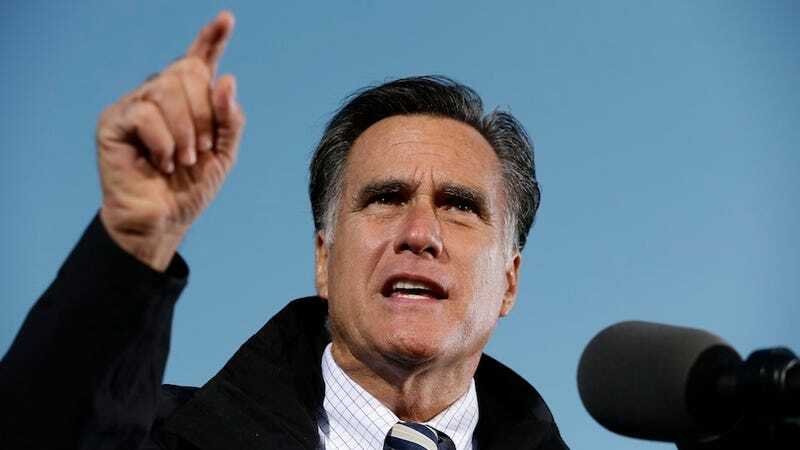 When Romney was confronted by the late Senator Ted Kennedy about his poor record of hiring women while he was at Bain Capital in the 90's, Romney replied that the problem wasn't that Mitt Romney was bad at hiring women, but rather that women simply don't want to work there. He also claimed that elite business schools don't graduate many women, a statement countered by the fact that when Romney was at Bain, about 30% of Harvard Business School graduates were women. Romney's spent his entire life living in a dude paradise, and his entire campaign trumpeting dude paradise slogans. The question of whether a feminist of any stripe — Mormon, Catholic, Muslim, Buddhist, Pastafarian, whatever — would support Romney is one that shouldn't even need to be asked. Unless you think that being "feminist" means that every woman should be free to make dinner for any man she wants.